When Dirty Americans are at their best ... such as on the classic rock style of "No Rest," the alternative-leaning "Car Crash" or the straight forward rocker "Burn You Down" ... they're solid rockers in the vein of Blue Oyster Cult and the more energetic material of Cheap Trick. At other times, however, such as on the somewhat psychedelic and somewhat dull "Dead Man," your fingers will be itching to punch the Next button, jumping to the next, and hopefully more powerful track. That may be somewhat unfair. Even "Dead Man" isn't a bad song; it just isn't very engrossing or engaging. Thankfully, much of "Strange Generation" is. Dirty Americans have a unique knack for combining classic rock with a modern rock sound -- a la Foo Fighters or Queens of the Stone Age -- and the result, though not quite as successful as those bands, is strong enough to earn the band a listen. 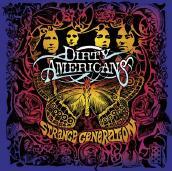 Dirty Americans: Myron - Vocals; Jeff Piper - Guitars and Vocals; Pete Bever - Bass and Vocals; Jeremiah Pilbeam - Drums and Percussion. For more information, check out www.dirtyamericans.com.